I did my first run since Saturday tonight after work. It was meant to be a very easy run but it was very windy and wet and so I worked a little harder than I’d planned. My legs felt fine and it was encouraging to sense I’m recovering well. One of the things that I like to do after an ultra is to jot down some lessons that I’ve learnt to help me for future races. This is the first time I’ve done a timed event so thought it was important to write some things down before I forget. I can honestly say that I really enjoyed running round and round a loop. It was a lot better than I thought it might be. I think it really helped that it was 4 miles and had a lot of variety with some stunning views. I don’t think I would enjoy a smaller flatter loop but this one was just right. I’ve realised that running a loop is great for someone like me who likes to analyse and set up spreadsheets! 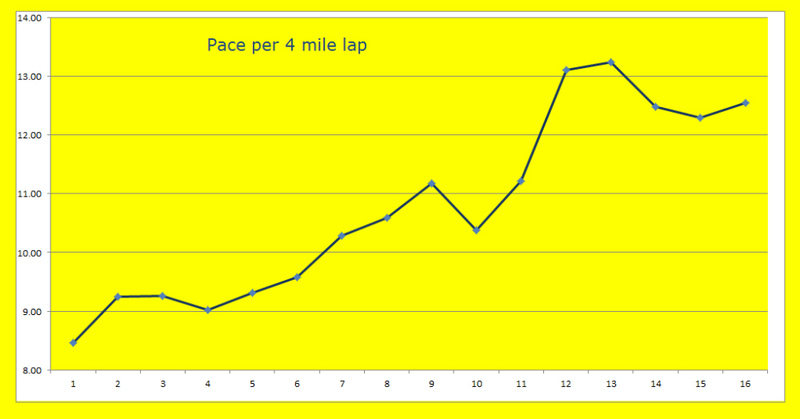 On a normal ultra it’s hard to compare splits as the terrain is different over the route. 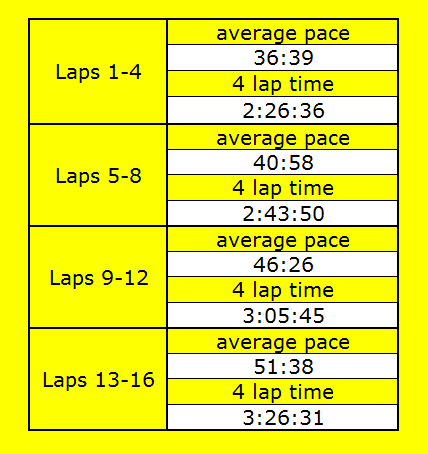 But here I have 16 lap splits that I can compare and work out how much I slowed down. So I slowed down by about 4-5mins per lap as the race progressed. I felt that is fair enough. Considering that no-one went past me after about 3 laps everyone else must have been slowing down as well. I would love to see what others did to compare. I think Mike Adams is going to post the lap times so when he does I’ll compare mine with a few others. The one I’d love to see is winner Stevie Gildea. Stevie ran over laps and basically ran the whole way with veryfew walking breaks. So I wonder whether his lap times stayed more consistent than mine? I was pleased to see that the last 3 laps weren’t the slowest and that I was able to get going again after a bit of struggle on laps 12 and 13. I ate something at the end of every lap. I had a cup of soup and brown bread after each 4 lap block. I also ate a peanut butter sandwich, some youghat raisins, and a few fruit pots. Drinks wise I had plenty of water, some flat coke, a cup of green tea and a few swigs of an energy drink. Plus 3 succeed tablets. I felt my energy levels were good to the end so hopefully I was eating enough. I wore my Hoka Mafate 2’s for the whole race. I didn’t change socks and my feet were good. I had a couple of blisters but nothing that bothered me. I think my problems come when my feet get really wet. I do feel the Hoka’s are great on the long downhills. I really feel I’m running stronger on the downhills with the Hoka’s. I wore the same knee length skins and shorts for the whole race. I changed my top after 4 laps. I’m sure I could have kept the same shirt on but I like the feeling of changing tops regularly. It’s gives me a boost. I didn’t stop at all during the race. The most I had was a slight pause to change top. I used the field to walk and eat and that worked well. I was very happy to finish 2nd but I’m well aware that the position you finish in a race is fully dependant on who is in the field. But you can only compete against who is running so I’m, proud of my 2nd place. It doesn’t happen very often!! My performance is more important and even when Katrina said I was in 2nd place it didn’t really make any diference because I was pushing hard to reach 16 laps. Over the past couple of years I’ve had some real battles in my ultra races. Particularly 2011 whw and this year’s Lakeland 100. I was pleased to finish both of those races but the finish was what it was all about. It’s great to see you putting away a performance at the upper end of your own and other peoples expectations. I’ve been following your blog for a couple of years now (since the RAW in 2010) and seen you doing great times at 10k and half marathon distance. However, your ultra’s don’t seemed to have come through in the same way like they did when you do your PB’s on the Fling and WHR. Is it me or has the 12hr Glenmore race been one of your best performance for a while? I do think it was my best performance for a while in ultra races. I loved the fact that I was still running as hard as I could right to the end. In most of my ultras over the past year or so I’ve been struggling from 30miles onwards so it was good to feel stronger. I’m sure there are lots of other lessons but that will do for now. Well done again John, glad you enjoyed the race! You should try Caesars Camp 100, 10 x 10mile laps but the terrain changes so much each lap, and most of it is in the dark (lots of short, sharp hills) it's never boring. Are you coming to join us at http://www.ultratrail26.com/ lovely routes! It's sounds like you ran a well controlled race, didn't make any mistakes and put away a performance that fulfilled your potential. Getting everything right on the day is surprising hard to do in an ultra. Kudos! Getting blisters does sound like something can be fixed. Have you tried Injinji Toe Socks? I have a pair and why they feel a bit off the first few times you put them on they work well. The lack of seams and how well they cling to the toes has to help in avoiding blisters. On the Hoka front, I do wonder if the fact that you do your daily training in cushioned shoes means that you also need something highly cushioned when you go an run ultra distances. In previous years you've used shoes like Roclite for trail ultras and struggled sometimes, and I wonder if it wasn't that Roclite's didn't have enough cushioning but rather had less cushioning than your road shoes that you did you weekly training in so you hadn't built the foot strength and technique sufficient to go far in them. I mention this as it might provoke a discussion as to whether the adoption of the Hoka might be a symptom of a problem in training rather than a general solution. Might an alternative route be building better foot strength and form in training by wearing more minimal footwear in daily life and training?